The books keep rolling in! It’s getting challenging trying to keep up with the book reading/reporting between all my other duties. However, since the readers seem to enjoy them (or maybe it’s the giveaways), I will keep doing them! This hardcover book is about investing, portfolio creation and risk management. 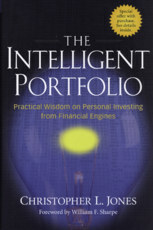 It’s titled “The Intelligent Portfolio – Practical Wisdom on Personal Investing from Financial Engines” written by Christopher L. Jones. The book is fairly lengthy and technical, but the beauty lies in the summary at the end of each chapter. Christopher L. Jones is Chief Investment Officer and Executive Vice President of Investment Management for Financial Engines. Working closely with founder William F. Sharpe, Jones built and led the team of experts in finance, economics, and mathematics that developed the financial methodology for Financial Engines’ personalized investment advice and management services. Jones has led the investment management function at Financial Engines for more than a decade. He holds an MS in business technology, an MS in engineering-economic systems, and a BA in quantitative economics, all from Stanford University. The most important diversification is the split between stocks/bonds, then between domestic/international equity. Minimizing your investment expenses will result in a huge difference in portfolio value over the long term. Higher expected returns will have a higher risk associated with them. However, not all high risk investments come with higher expected returns. The most important factors in choosing a risk level are the tolerance for downside outcomes and the time horizon before the money is needed. Investing in individual stocks are an unnecessary gamble. Historically, investors do better with diversified instruments like ETF’s/index mutual funds. I enjoyed this hardcover book as it provides a lot of insight into the value of diversified low cost index investing through facts and hard earned experience. I would say that this book is geared towards investors who are already familiar with the markets but looking to expand their market knowledge. For the beginner investor, this book may be a little intimidating and a touch on the dry side as it is fairly technical. However, I would say that this book would provide the right start on how to create a diversified portfolio at a risk level that is right for you. Contest will end Thursday 5pm EST June 12, 2008 and the winner announced shortly afterwards! Find out how you can save an additional 4% on this book from Chapters. Looks interesting, however I’d rather read a book that also spoke of the Canadian market. Interesting review. I would love a free copy and I do have a N. American address! Let me know if you select me and Thanks for keeping up with the reading and posting the information! Sign me up for the big W! This book looks like a very fascinating read! I was just looking for some more advice on how to start creating a portfolio. Looks like an interesting read. Excellent. I love these contests! Thanks again FrugalTrader. Thanks for the contest! Sign me up. A book about the strength of index investing, that sounds very good! Always want to learn more! Sign me up for the draw! Sounds like a great book. You can never have too much knowledge especially when it comes to investing. sounds like it would be a fairly interesting read. i would like to see how this differs from the other investment books i have read. Time for me to level up from beginner to high-beginner books, as we’re just setting up self-directed RRSPs. This sounds like a useful book at this point in our financial journey. Seems like an interesting read. And the price is right! I like these investing books that have a mathematical basis to the theories. Does it also show how to recognise when a higher risk investment won’t come with higher returns? Pick me for the free book! This could be a good read! Please, count me in. I would love to read something serious on the topic. An intelligent portfolio? Count me in for the drawing! Thanxs for the review. Good luck to everyone. Looks good. Mine could certainly use some sprucing up! This book sounds like what I need. Another very interesting book read from a very interesting site. When are you going to be writing your own book FT? Sounds like a good book. I like the sounds of a book with a heavier technical weighting. Often I find books tend to shy away from the technical side of things to appeal to a larger audience. This makes it hard to find good material if you are interested in those details. Sounds like an interesting read; especially about choosing ETFs over individual stocks. Has this book on portfolio creation changed any of your views on using a couch potato style portfolio? Please put me in for the draw. Hope foreign markets are sufficiently addressed! The contents of the book seem so interesting so it would be great if I can have a chance to read it through. Sounds like an interesting book. Please put me in for the draw. The book sounds great. Sign me up! Elvis is in the building lol. I’d be interested to see how they reconcile the every-percentage-point-counts philosophy with the advice to diversify between stocks and bonds. If you’re not using your savings for a decade or two, what good are bonds? Wow! Everyone loves a giveaway. Including me! I like books that aren’t afraid to throw some technical information at you. When I have a methodology to chew on, I can apply the writers’ systems to my own list of investments and see how closely I fit in. The whole idea about asset allocation, and ETF index investing seems like it fits in well with the popular investing mantra of the day (at least in the PF blogosphere), so it would be interesting what new material is brought to the table with this publication. I am interested by this book! Thanks for giving it to one of your reader. Looks interesting… especially for the individual investor. First post here, although I’ve been reading with interest since the first of the year. Thanks for all your postings and efforts, you remind me of myself a few years ago – you’re on the right track in many respects, in my opinion. We’re always reading and learning, so a chance to have a new book in the library would be great. I’m interested in the ETF vs individual stock comparison. I am in for the win! What do we know about author’s, Christopher L. Jones’, investing track record? Is he just a book worm? Sounds like a good read, I’ll toss my name in the hat. Sign me up! Is there any discussion of asset allocation? Please count me in! I haven’t read this one yet! I appreciate your effort on this blog. Love it! I have never heard of Christopher Jones, but put his name next to Will Sharpe and I’m sold! Beginner investment books are a dime a dozen these days, but a solid guide for advanced investors is rare. I look forward to reading it. The best thing you can do as an investor is to read as many books out there like this one. It’s important to learn what your investment style is. Once you learn and understand the basics, draft up a strategy and test it. If it’s successful, use it as your base and continue to tweak, perfect, or create new strategies that could provide higher returns at a reduced risk level. But more importantly, use a stop-loss you’re comfortable with to protect you in the event unforseen market forces go against your position. These are general tips I realize, but very crucial in building an investment foundation with which you can fill the gaps and learn how make money. Looks like a good one, love to read! Previous post: Hybrid vs. Gasoline Vehicle Comparison – Are Hybrid Vehicles Worth it?